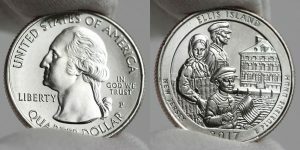 Released last week on Monday, Aug. 28, the Ellis Island quarter is the fourth of five 2017-dated issues. Its reverse depicts an immigrant family approaching Ellis Island with a mixture of hope and uncertainty. The hospital building on the New Jersey portion of Ellis Island is visible in the background. 1,887,900 for the 2017 Ozark Riverways quarter (Missouri). 2,009,180 for the 2017 Frederick Douglas quarter (DC). 1,890,460 for the 2017 Effigy Mounts quarter (Iowa). 2,032,380 for the 2016 Fort Moultrie quarter (South Carolina). 1,951,520 for the 2016 Theodore Roosevelt quarter (North Dakota). 1,998,340 for the 2016 Harpers Ferry quarter (West Virginia). 2,042,780 for the 2016 Cumberland Gap quarter (Kentucky). 2,131,840 for the 2016 Shawnee National Forest quarter (Illinois). Elsewhere, the 2017-W Proof Platinum Eagle and the 2017-S Enhanced Uncirculated Coin Set finally moved forward after weeks of downward adjustments. The Platinum Eagle climbed 108 to 8,887 and the set advanced 2,512 to 189,816. The U.S. Mint published sales data for 298 numismatic products. One hundred and sixty-nine products outperformed their prior weekly gains compared to 94 previously. Not counting the new Ellis Island quarters, 8 products increased by more than 1,000 units compared to 7 previously. No products saw their sales total reduced compared to 7 previously. Below are tables showing the latest sales for U.S. Mint numismatic products. The sales period covers Aug. 29 to Sept. 3. Products with an asterisk (*) are no longer available. I’m waiting for the Texas 5 oz. coin.